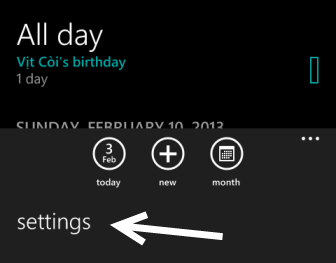 The Calendar app in Windows Phone 8, by default, will assign a different color to each type of event or synced account. This may cause confusion when you try to identify which events come from which accounts. To better control and manage them, you can manually set the color for the events or accounts that matter most to you. Continue reading to find out how. 1. Launch the Calendar from the app list or the pinned live tile. 2. Once the app is loaded successfully, tap the small dots icon at the bottom of the screen to slide the menu up, and then choose settings from the list. 3. The settings page will represent all the accounts that are currently in sync with the system. The events of each account will be listed right under it. You can change their colors by tapping on the appropriate color name in the rectangle box. 4. With up to 20 colors to choose from, it is very hard to have events with the same color. In addition, if you want the color of the event to match the theme of the system, just choose the theme color option at the top. The color in the box represents the current theme color, and may be different from the screenshot below. 5. Once you have set up everything, just come back to the calendar or event view to see the changes.